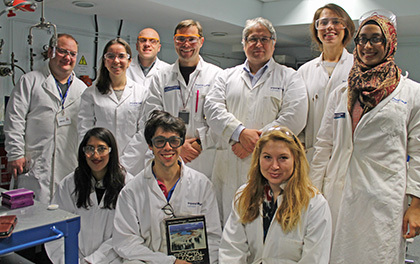 The core carbonate group is composed of members of Dr. Cédric John's research team (team photo on the right). The core group specialises in applying stable isotope geochemistry, notably carbonate clumped isotopes thermometry, to complex geological problems. To be able to do this, the team has built and operates the world-class Qatar Stable Isotope laboratory. The core group uses outcrop and core samples to address research problems in carbonate diagenesis, paleo-climate, sedimentology, stratigraphy, and isotope geochemistry. 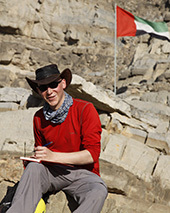 In addition to the expertise of the core carbonate group, a multidisciplinary network of affiliated members within the department provides a strong mix of expertise in engineering and geology. This allows the group to tackle fundamental research questions ranging from paleoenvironments to reservoir engineering. A good example of a research project benefiting from the synergy created within the group is the $70 millions, 10 year-long Qatar Carbonates and Carbon Storage Research Centre (QCCSRC) project. This ambitious scientific initiative aims at understanding carbon capture and storage in carbonate reservoirs, with the goal of reducing the carbon footprint of the State of Qatar.